Recently we have seen a number of films announce their historic and revolutionary LGBTQ inclusion. And then when the actual product has been released it’s clear that all that hyping in the press has been… rather exaggerated. We saw this with Beauty and the Beast which widely spread across the media as having DIsney’s first openly gay character on film! And with Power Rangers loudly proclaiming they have the first gay superhero! Yaaaay! As an aside - can we not all leap in with lists of “queer-coded” Disney villains - i.e. nearly all of them - as evidence of previous gay representation? Any kind of coding/implication/subtext is not representation and it’s extremely problematic that LGBTQ people are continually expected to accept these as representation. We’re repeatedly told that we have to celebrate subtext as inclusion while the erasure of actual LGBTQ people continues - we deserve better than to be the Love That Dare Not Do More Than Imply Its Name. It’s also a pernicious homophobic trope to “gay/queer code” villains: presenting markers of LGBTQ sexuality as evil is tired, common and in no way should appear anywhere as praiseworthy or representative. So, please please do not do this. As these films actually hit cinemas it quickly became clear that the actual representation was… lacking. LeFou in Beauty and the Beast after spending the whole film working through a checklist of gay stereotypes ended up dancing oh-so-briefly with a man. It wasn’t even something he sought out, it just kind of happened. While it may shock you, your very brief dance partner does not actually indicate your sexuality - just look at all those tedious reality-TV-dance competitions that adamantly won’t pair gay contestants with their own gender. Ground breaking representation it was not. Well, damn, I’m amazed cinemas didn’t have to deck the rooms in rainbows to respect the sheer power of the representation here? Even with these not exactly being hailed and universally praised by LGBTQ people, it has kept on happening. Marvel is becoming an expert - from taunting about Captain America, they teased with Black Panther, then crushed the hopes, then the echoes hadn’t even died before they decided to pull the same damn nonsense with Guardians of the Galaxy 2. Any guesses as to there being an LGBTQ character there? No guesses needed - it didn’t happen. DC is getting in on the action already teasing hints about a female love interest for Wonderwoman. Star Wars is such a repeat offender of this - and despite repeatedly teasing the possibility of a gay relationship it’s never emerged. Yet even while saying that the next film will not have LGBTQ inclusion - again - they’re still teasing the vague, ill-defined possibility in the film after this. Anyone holding their breath? It’s opposite number, Star Trek pulled a Le Fou with Sulu - and then cut it down and reduced it because blink-and-you-miss-it is portrayal now. Fantastic Beasts 2 is also teasing the possibility of a gay romance - of course with no confirmation at all so, again, don’t hold your breath. But this is the habit - writers, actors, producers go to the press, they tease, they torment, they raise hopes then they crash them. Of course, this just seems like it’s continuing the habit of the book - because people are still praising JK Rowling for her awesome - but completely non-existent - LGBTQ inclusion. Hey, Word-Of-Gay counted as inclusion in the books, why wouldn’t we let it pass on television? People have written about how disappointing this is - and it certainly is, but it’s made worse when you see what a habit this is; so much so we have discussed this previously but it keeps happening over and over: We see producers, writers, actors and various marketing gurus running to the liberal-leaning press and websites, especially LGBTQ media, to crow at how wonderfully inclusive they are only for their end product to be either completely lacking or an utter trainwreck. This is not new - we wrote about it before as being a major problem. But, if anything, it’s becoming more common. It seems nearly every film now has to have the obligatory tease and disappointment - over and over again. And we have certainly seen this with our shows - from the following tweets from the writer of the erased Constantine. Even shows which do have LGBTQ characters frequently over hype them - we’ve spoken about the infamousness of Teen Wolf - but Vampire Diaries repeatedly sold their terrible gay characters way beyond their prominence or importance. Magicians sang the praises of Eliot in the gay press before the series aired never mind what a homophobic hot mess that turned out to be. Last Ship has actresses doing in depth interviews about Alisha despite her being little more than furniture and The Walking Dead did this repeatedly with both Tara and Jesus - when he literally came out in the second to last freaking episode and it was ONE LINE. This is happening over and over again and it has to stop. These people are exploiting a community’s desperate need for representation and crushing those hopes time and again. They are baiting us in over and over, knowing we want this badly - knowing we need to see ourselves on screen - so they can grab ticket sales and box office numbers but never actually deliver on their false promises. At this point it isn’t ignorance or confusion - it’s open, malicious homophobic exploitation. 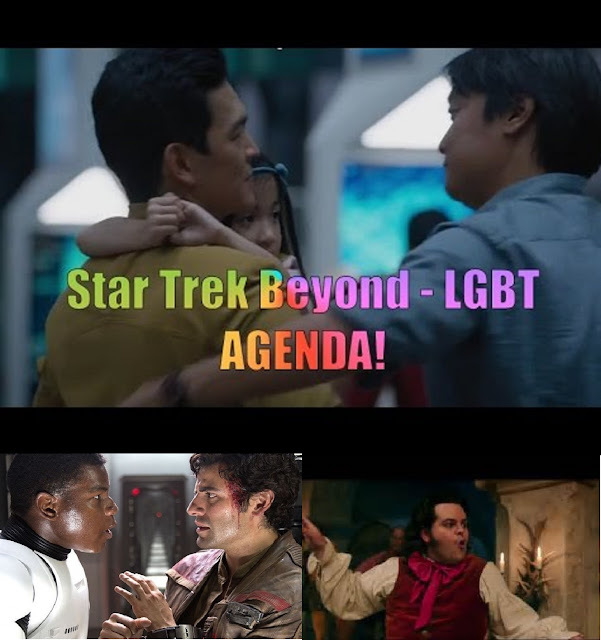 This isn’t just a matter of erasure - though that is definitely a problem - nor is it about films and shows that don’t have LGBTQ characters (though, again, that is a serious problem). This is about the continued HINTING there will be LGBTQ inclusion, selling that LGBTQ inclusion, getting us into cinemas and tuning in looking for that LGBTQ inclusion and then failing to deliver time and time again. This isn’t just about erasure -it’s about blatant fraud and preying on LGBTQ people. It’s disrespectful, it’s homophobic and it’s predatory and it has to stop. If you’ve erased LGBTQ people from yet another film at least have the decency to own that and not lead us on. Sense8, Season Two, Episode 11: You Want a War?